A thureophoroi regiment, the backbone of any Successor army, the old expendables. 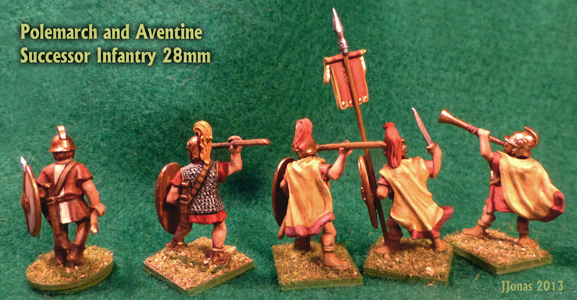 They are mixed 28mm figures from Old Glory, Newline Designs, and A&A figures that have been converted a bit. 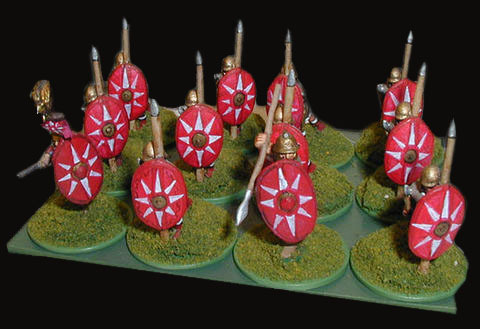 Some have Essex shields. 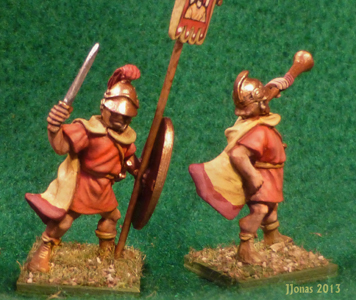 The color scheme is from an Angus McBride plate in the Montvert book on the Seleucid army. The Old Glory, Newline Designs, and A&A figures make for a good mix. The standard is from my ancient stash of Ral Partha items. 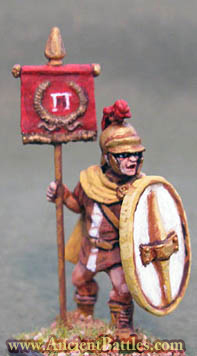 The standard bearer is an A&A command figure with an Old Glory head swap. 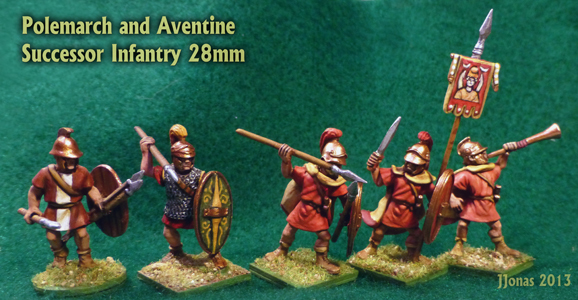 The Newline Designs Figure on the left has an Essex shield with nice molded on javelins. 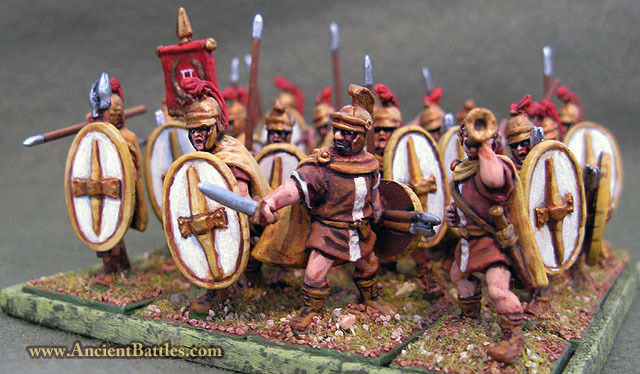 Images by Angus McBride that inspired the models, note that one fellow has a round bronze faced shield instead of a thureos. Also notice that often figure sculptors miss the fact that the Successor verison of the thureos is often much more streamlined, with a elongated and rounded boss and often without the rectangular reinforcing plate tacked on the front. I'm hoping the new next generation of figures will address this nuance. When boss plates are shown on funary stele they are often in a more interesting shapes such as on the stele of Dioskourides at the top of the page. 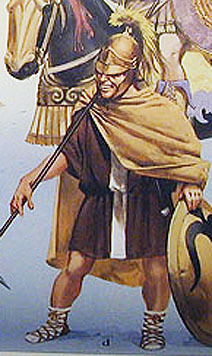 The thureophoros is the ubiquitous Hellenistic mercenary. Phalanxes and armored cavalry may have stolen the glory in the infrequent large battles, but the majority of work fell on mercenaries who patrolled the borders, guarded fortifications, and asaulted cities. 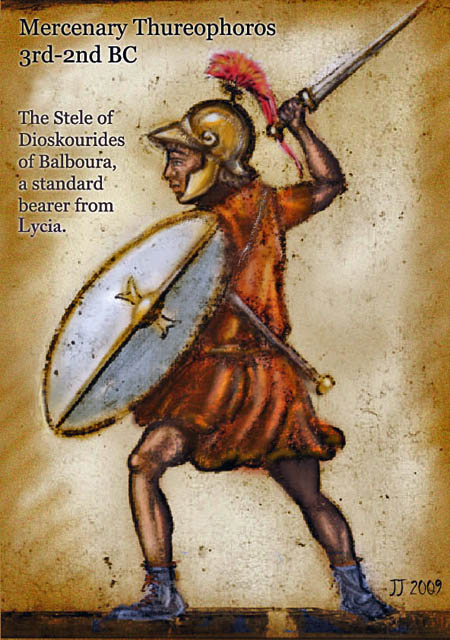 The thureophoros, like many ancient warriors gains his name from the shield he carries. This is the Greek version of the Celtic shield they mocked, calling it a "door stop" because it was shaped like the oval stones the Greeks used to prop open doors. The commentators openly describe that the thureos offered little protection to the Galatians as they were set upon by Aetolian missiles. 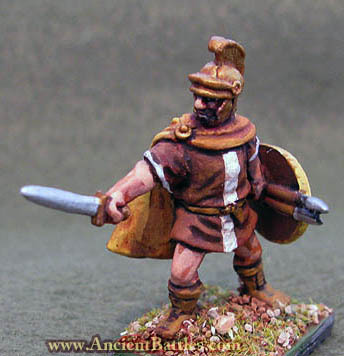 But soon after the Galatians were thrown out of Greece, mercenary soldiers began to adopt it as an alternative to the heavy bronze faced hoplite shield. As the wars between the Successors dragged on over time, their need for cheap useful mercenaries was insatiable. Eventually the thureophoroi, as the soldiers became known, served in most Successor armies. 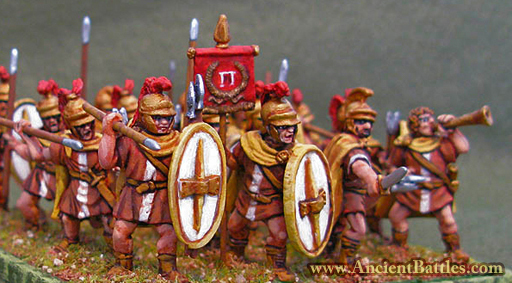 Contingents of Achaeans and Aetolians are cited in the great battles and frontier skirmishes. The Greeks who were instrumental in the Ptolemaic victory at Raphia are likely to have been thureophoroi. Asia and the levant was another great source of hired manpower. The image above is a Pisidian, from Asia, (modern day Turkey). His funary stele is in the Istanbul Museum. He is typical of the thureophoros. 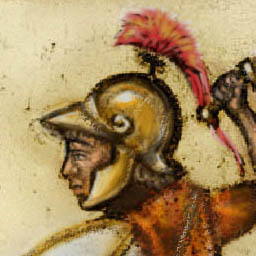 He has a straight sword attached to a baldric, and a typical Successor style helmet with a reinforced crown and crest. He wears laced boots, and a crimson tunic. His thureos is white with bronze boss and edging. 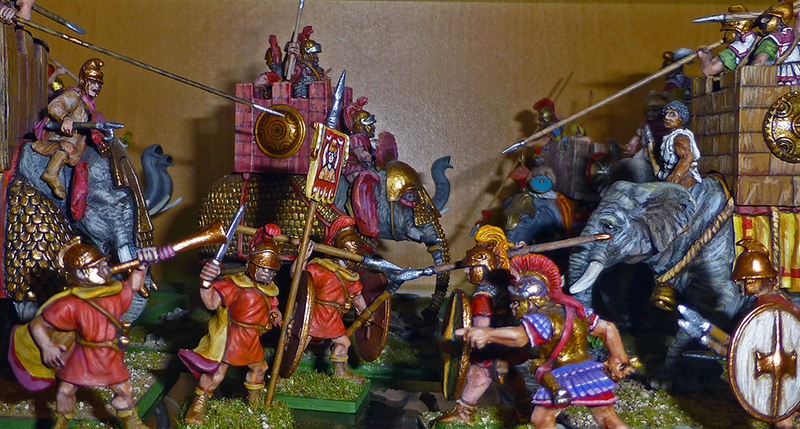 Thureophoroi on the battlefield are most often deployed on the wings, in position to cover the flanks of the phalanx. 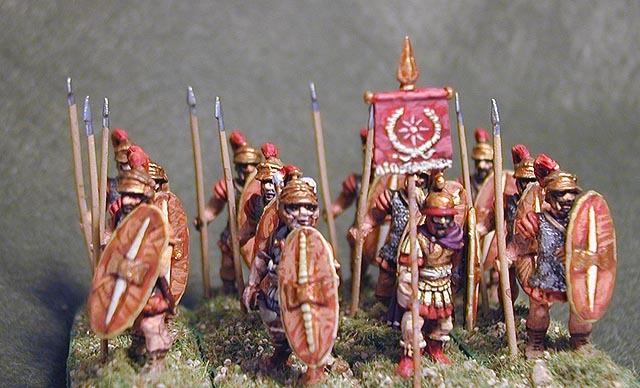 Their smaller formations were more flexible to cover more ground quickly, which made them well suited to protect a flank of a more rigid phalanx. 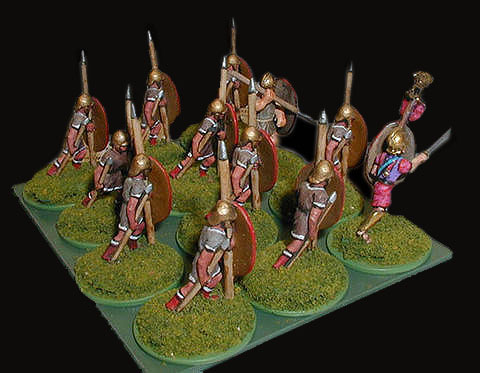 The tactic wasn't new as Pyrrhus of Epirus used Samnite troops to bridge the gaps of his phalanx and help it from being penetrated by Roman Maniples. 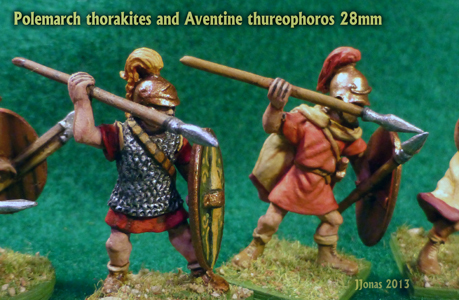 Thureophoroi also had the dual role of skirmishing or working in rougher ground, they may have traded their spears for javelins for this role, or they may have used both if needed. The normal routine of the thureophoroi was not pitched battle, but the more constant duty of guarding lines of communication, and defending the forts that separated states in greater numbers than ever before. 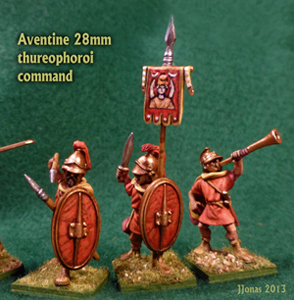 So as the armies pushed on to invade the enemy turf, the thureophoroi were needed to garrison and occupy the lands. When Parthian raiders swept into Judea, the Ptolemaic thureophoroi would be those who marched out to drive them away. The mercenary thureophoroi of Pergamum were the first line of defense against the Galatians who had set up a brigand state in Anatolia. 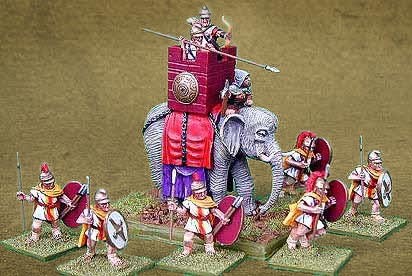 In the great sieges the generals got their fodder from the thureophoroi.... the men who pushed the rams, and pulled the giant siege towers into position... men who were more expendable than settlers and ethnic Macedonians. 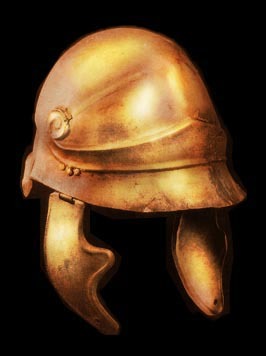 "In the meantime the citizens made a stout defense, and Demetrius, out of heat and contentiousness very often, more than upon any necessity, sent his soldiers into danger; until at last Antigonus (his son), observing how many men were losing their lives, said to him, "Why, my father, do we go on letting the men be wasted in this way, without any need of it?" But Demetrius, in a great passion, interrupted him: "And you, good sir, why do you afflict yourself for the matter? will dead men come to you for rations?" 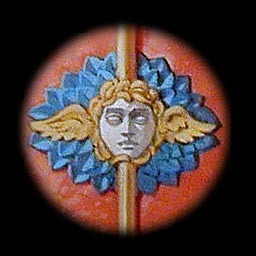 But that the soldiers might see he valued his own life at no dearer rate than theirs, he exposed himself freely, and was wounded with a javelin through his neck, which put him into great hazard of his life. But, notwithstanding, he continued the siege, and in conclusion took the town again." I have taken the liberty to colorize one of Ian Heath's images from AMPW* at left. 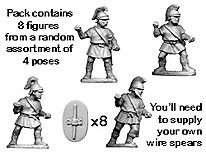 This figure shows the controversial 'dual armament' of the thureophoros. 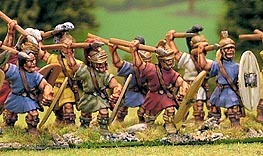 Some folks have recently attacked the idea of both spear and javelins being carried together. Most funarary art show spears or javelins, rarely both. Since it is not impractical that soldiers could carry and use both it is often judged irrelevant. 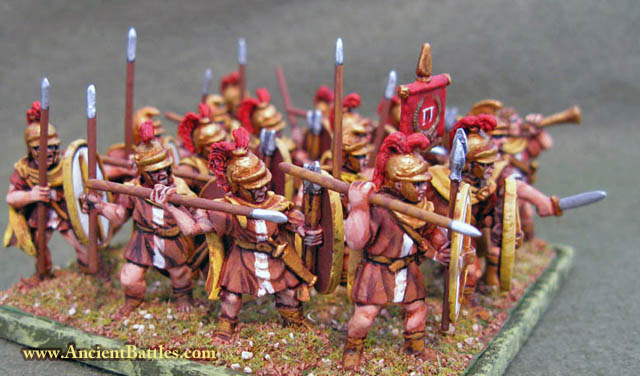 But the thureophoros would usually take specific role in a combat situation, and it seems unlikely a soldier would carry a spear to a skirmish, or extra javelins if he was going to fight in close order in the battleline. 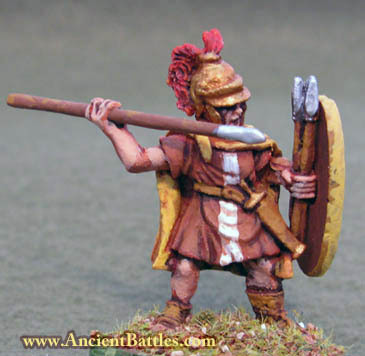 On guard duty a spear is more likely, and maybe both spear and javelins should be handy if defending a frontier fort from Parthian raiders, Saka tribemen, Nubians, or Nabataean brigands. Cloaks may or may not have been worn in combat and may have been given out as rewards in Successor armies. There is really no way to tell if uniformity was the norm. Mercenaries may have been outfitted by their Successor paymasters, but it's just as likely they showed up with what gear they had. 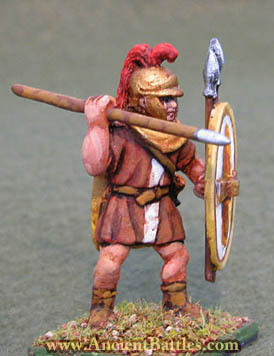 One of the reasons for the increased availability of mercenary soldiers was the cheapness of the thureos and their gear, since a bronze faced hoplite shield is an expesive investment. However, in the end the constant wars drained manpower from Greece, as the young men were lured away from the small farms and were rewarded with land in Asia or Egypt, or on the Oxus in Afghanistan. 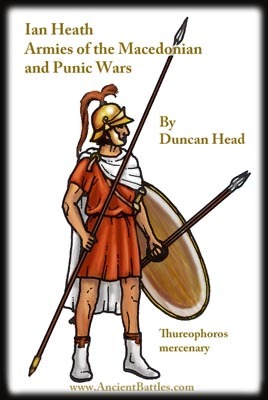 * Duncan Head's "Armies of the Macedonian and Punic Wars" (AMPW) is still the best overall source for Successor uniform information. Here are two images of terracotta thureos shields found in the so called tomb of the Erotes near Eretria. The soldiers interned here were likely from an Antigonid Macedonian garrison. The interesting thing here is these show very ornate decoration and multiple colors on the thureos in relief. They are also much more narrow than usually depticted. 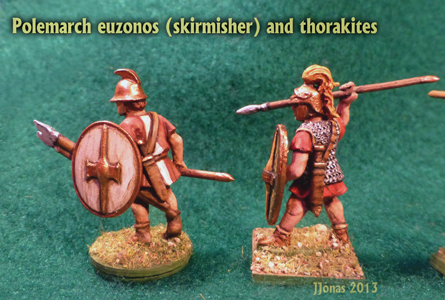 The newr models up top far outshine my oldest unit of thureophoroi, these being MiniFigs and RAFM true 25mm figures from the 1970's and 1980's (below).